We are short walk to Key Largo and fishing, diving, a swim with the dolphins & charter boats, located on the beach and across from fresh water swimming pool. We offer rooms, cottages & waterfront accommodations and specialize in sunset weddings complete with a notary on staff. Enjoy beautiful and clean hotel lodgings and suites with fully Equipped kitchens, cable, color TV & VCR, Private showers. Pelicans and White Heron share this beautiful Resort, tucked away in a lush of tropical vegetation. Walking distance from some of Key Largo's best nightlife, dining, and attractions, including Glass bottom boats, casino ships, and even the original African Queen! Dive shops are also within walking distance, and the Penneykamp Coral Reef State Park is just 3 miles up the road! Click here to see a map. Along with the birds, there is an abundance of sea life that comes into the bay. Manatees visit regularly, and have become a regular occurrence at the Sunset Cove Beach Resort. The crystal-clear water gives excellent viewing opportunities. You can sit on the dock or watch them from the boat. Our guests enjoy beautiful and exceptionally clean accommodations. We have many Indian Chickee huts, a nice tiki swing on the water, and Bar-B-Q pits. 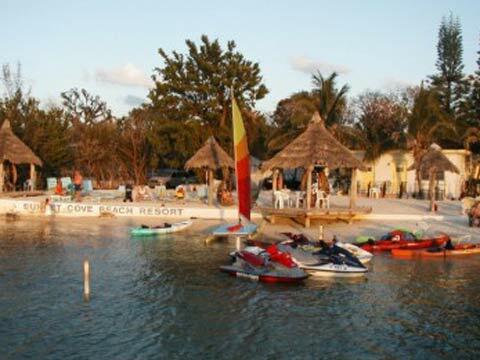 There are also several watercraft, such as canoes & kayaks, available free of charge to our guests. The atmosphere is a true island atmosphere, with tiki huts dotting the grounds, and the beautiful vegetation giving one a feeling of being in a different time. For an exceptional getaway, call us toll-free to secure your reservations: (877) 451-0705.